All it takes is one handshake to speak for his love of the soil. By full swing of the farm season, his calloused hands are, what seems, permanently etched with beautiful brown lines similar to that of his vegetable rows. He is a man of his beliefs, motivated by his love of growing organic vegetables that are in tune with the beating life force of nature. From a young age, he left suburb Ontario and sought out the wilderness of BC’s Mountains, where he farmed with a friend to sustain themselves off-grid. In 2010, he and his wife leased a three acre parcel of organic farm land amidst Abbotsford’s raspberry fields. They began growing produce for the Abbotsford Farmer’s Market, adding a weekly organic vegetable box program. It was there that they began to know the true beauty of a community supported farm: the joy a direct connection to their customers can bring. In 2016, his dream of finding a piece of land to call his own came true. 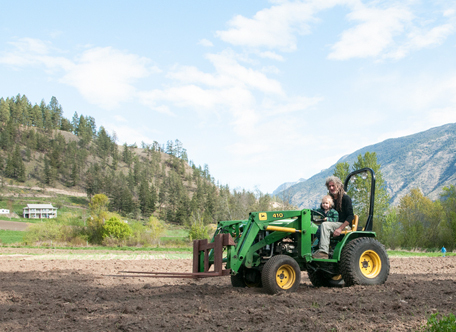 With his wife and son, he moved One Love Farm to the fertile and sunny benches of the Fraser Canyon. Here, with mountain goats looking down on them, he continues to work the soil with his hands while the Fraser River drifts past and down to the Fraser Valley with promise of great things to come.